NEW YORK, NY – This morning we received a phone call from the Cleveland Browns legal department, asking us to remove all mention of our self-made ‘victory fridge’ from all social media channels as we featured a beer that was not an official advertiser of the organization, in conjunction with Browns’ logos. As the story goes, Bud Light and the Cleveland Browns thought it a wise marketing effort to design ‘victory fridges’ which some have argued capitalizes on the despair and heartache of Browns fans, adding fuel to the fire that is our existence in football futility. The concept was simple: if the Cleveland Browns ever win a game, these fridges would unlock, allowing thirsty Browns fans to celebrate with free beer, as if to miraculously quench the last 632 days we’ve spent since the Browns last won a football game. Let it be known, that as upstanding members of the Browns Backers’ community, the Big Apple Browns Backers of NYC have obliged and wiped clean our digital history and want to apologize if we have offended the commercial folks over in Berea. Within minutes of ESPN sports business reporter Darren Rovell breaking the original Bud Light story, we were inundated with inquires from our dedicated Big Apple Browns Backers members, asking us to contact Bud Light in hopes of getting our own fridge. Upon request, we were informed by our local Bud Light distributor that the fridges would not be made available to any bars outside of Cleveland. Fair enough. As one of the largest Browns Backers chapters in the entire country, known to draw crowds of 200-400 rabid CLE fans any given Sunday, we were clearly discouraged by their decision. In an attempt to reward our members for their unwavering support we decided to make our own victory fridge, filled with bottles of champagne, cinnamon-flavored whiskey and lots of a beer that-is-not-to-be-named. Sadly, the Cleveland Browns and Bud Light did not share our enthusiasm, and called with a stern cease-and-desist request because we placed decals on our fridge that used the Cleveland Browns logo and word-mark, which are not allowed to be associated with a non-paying team advertiser, given the established Cleveland Browns Backers Bylaws. We get it and we’ve fixed it. Clearly it wasn’t our intention to get anyone in trouble here. Over the last 7 seasons, we have grown our chapter into one of the most dedicated & diehard the Browns Backers Worldwide have to offer. Our members show up every Sunday, loss after loss, taking time out of their busy lives to support a team that continuously lets them down every single week. 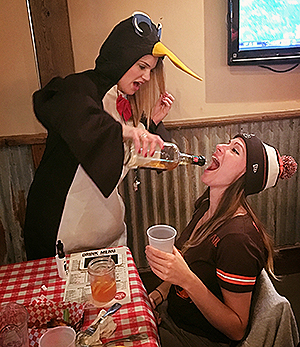 Over that same time period, the Cleveland Browns have embarrassed their fan-base, going 24-78 (.235), becoming just the second team in NFL history to go 0-16, and are SO bad that their official beer sponsor thought it would be justifiable to celebrate that losing-effort with a marketing gimmick. Cleveland Browns, we hear you loud and clear. Noted, acknowledged and remedied. Call off the lawyers — we need to save those legal fees for half-priced wings and $12 pitchers of not-Bud Light. Note: Fox 8 Cleveland covered our win fridge saga on the Sep 18th evening news. Video below. 2018 will be the 8th year for the Big Apple Browns Backers, the largest Cleveland Browns Backer location in New York City and arguably the most exciting chapter in the entire country. We’re a rowdy bunch and like our CLE sports misery mixed with a healthy dose of alcohol. We’ve worked hard to build an amazing community of Cleveland fans living in NYC and pride ourselves on welcoming all Browns fans into our flock. Visiting the Big Apple for the weekend? Cleveland-native that recently moved to NYC? 1st-time fan that’s all aboard the HYPE-TRAIN after watching ‘Hard Knocks’? JOIN US! We’ve got a massive private room (it’s the entire downstairs level), food & drink specials, and our own bar plus dedicated wait-staff. If you refuse a free shot by the Shot Penguin an angel loses it’s wings. Be nice to your bartender & wait-staff and remember to tip with appreciation. No reservations. We’re believe in communal / lunch-room seating. Get friendly. Doors open 75 minutes before kick-off (aka 11:45am). This is our church: treat the bar and space with respect. Fair warning: we don’t play nicely with other fans. If for some stupid reason you’re rooting for our opponent that week, you will be asked to leave and go upstairs (this counts for any friends or significant others you might bring). Steelers fans are strictly prohibited: they will be mocked relentlessly and escorted out by security. Plate breaking after a tough loss has been known to happen. Please ask management approval beforehand. And most importantly, always remember: THIS IS OUR YEAR! Looking for the largest & most fun Cleveland Browns Backers bar in all of New York City? We’ve got you covered! The Big Apple Browns Backers watch games at Brother Jimmy’s Murray Hill, their official Browns Backers location and the BEST Cleveland sports bar in New York City. Accept no imitations! The Big Apple Browns Backers are the rowdiest Cleveland Browns bar in all of NYC and one of the largest Backers chapters in the entire country. We’ve got a massive private room (it’s an entire level), food & drink specials, our own bar and dedicated wait-staff and only show the Browns games. No other games, no other fans! Looking for the largest CAVS bar in NYC? The Big Apple Browns Backers will be hosting watch parties during the 2018 NBA playoffs at Brother Jimmy’s Murray Hill, our official Cleveland bar in New York City. We do not accept reservations for the Finals. Both downstairs and upstairs are 100% first come, first served. We’ve worked with the Yankees to set aside discounted Cleveland Indians tickets for ALL three games of their weekend series May 4-6th in New York City. One night game and two day games! Ticket inventory has been reserved for us in specific sections to make sure everyone sits together no matter the price point chosen. Tickets are discounted from face value and much lower than prices on StubHub and Ticketmaster (by almost 50%).